Two allopatric subspecies of Mountain Zebra have traditionally been recognized, the nominate race E. z. zebra (Cape Mountain Zebra) and E. z. hartmannae (Hartmann's Mountain Zebra). Groves and Ryder (2000) proposed that the two be treated as distinct species, and Groves and Bell (2004) presented morphological evidence for separating the two subspecies as distinct species based on the diagnosibility criterion of the phylogenetic species concept. Recent genetic analyses indicate that the two populations have a high incidence of mitochondrial haplotype sharing; the hypothesis that Cape and Hartmann's Mountain Zebra mitochondrial lineages were reciprocally monophyletic was not supported. However, the presence of private alleles at nuclear loci rendered the two subspecies genetically distinct evolutionary significant units (Moodley and Hartley 2005). We continue to recognize Mountain Zebra as a single species comprising two subspecies following Penzhorn (in press). Historically, Mountain Zebras occurred from the southern parts of South Africa through Namibia and into extreme south-western Angola (Penzhorn in press). Two subspecies are recognized: Cape Mountain Zebras (E. z. zebra) were widely distributed along mountain ranges forming the southern and western edge of the of the central plateau of the Eastern Cape and Western Cape provinces of South Africa, from the Amatola Mountains in the Cathcart District westward and northward to the Kamiesberg in Namaqualand in the Northern Cape; Hartmann's Mountain Zebras (E. z. hartmannae) occur in the mountainous transition zone between the Namib Desert and the central plateau in Namibia, with a marginal extension into south-western Angola (Penzhorn 1988, in press). Novellie et al. (2002) postulate that the ranges of the two subspecies were separated by an area devoid of mountainous habitat between the northernmost point of the Cedarberg and Bokkeveldberg ranges, and the southernmost point of the Kamiesberg range. Today, surviving natural populations of Cape Mountain Zebra occur only in Mountain Zebra National Park, Gamka Mountain Reserve, and the Kamanassie mountains. 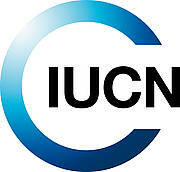 Populations have been reintroduced to various parts of their former range, including Karoo National Park, De Hoop Nature Reserve, Karoo Nature Reserve (recently proclaimed as the Camdeboo National Park), Commando Drift Nature Reserve, Baviaanskloof Wilderness Area, Tsolwana Nature Reserve. and Gariep Dam Nature Reserve (Lloyd 2002; Novellie et al. 2002). In Namibia, the establishment of artificial waterpoints have allowed Hartmann's Mountain Zebra to occupy previously unsuitable habitat, such that their present range differs from that in historical times. Joubert (1973) gave their range as discontinuously distributed in four populations: from Kunene Province southwards to the Ugab River and east to the Outjo District; the Erongo Mountains; on the escarpment from the Swakop River southwards to the Naukluft Mountains and eastward along the Kuiseb and Gaub drainages into the Khomas Hochland; and the Fish River Canyon and Huns Mountains near the Orange River in the south. Hartmann's Mountain Zebra are also established in three conservation areas in the Northern Cape, South Africa: Richtersveld and Augrabies National Parks and Goegap Provincial Nature Reserve. Hartmann's Mountain zebra may still survive in Angola, in Iona National Park(Crawford-Cabral and Verissimo 2005). Hartmann's Mountain Zebras have also been introduced outside of their range in the Western Cape and Eastern Cape (Novellie et al. 2002). In 1998, the number of Cape Mountain Zebras had increased from <100 animals in the 1950s to about 1,200 individuals, with the largest population (reintroduced), estimated to number 250 in 1998, in the Karoo National Park (Lloyd 2002; Novellie et al. 2002). The average annual rate of increase of the entire Cape Mountain Zebra population from 1985 to 1995 was 8.6% (Novellie et al. 1996), and from 1995 to 1998, 9.6% (Novellie et al. 2002). From 1998 to 2006 there has been a steady increase in the populations of Cape Mountain Zebras from 1003 to 1389 in National Parks and Provincial Nature reserves. In 1998, there were approximately 165 Cape Mountain Zebra on private lands; more recent figures are not available. Hence, the Cape Mountain Zebra population in South Africa has been steadily increasing since the 1980s. The current population size is estimated to be more than 1,500 individuals (ca. 500 mature) (Mountain Zebra Working Group, pers. comm., R. Smith 2008). 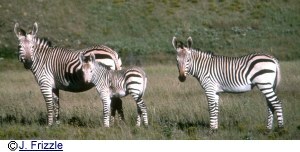 In 1998, the Hartmann's Mountain Zebras population was estimated to number about 25,000, or approximately 8,300 mature individuals (Novellie et al. 2002). Limited data from Namibia indicates that populations are increasing on communal lands in the north-western part of the country (G. Stuart-Hill pers. comm. 2008); from 2000 to 2006, numbers have increased from 6 to 27 individuals observed per 100 km of road surveyed. However, there is no information on the status of populations of Hartmann's Mountain Zebra in the protected, private and communal areas in the rest of Namibia (and see Major Threats). Mountain Zebra inhabit rugged, broken mountainous and escarpment areas up to around 2,000m with a rich diversity of grass species and perennial water sources (Penzhorn in press). They are predominantly grazers, only browsing if forced to do so. The typical social structure is one of small harems comprising an adult stallion and one to three (maximum five) mares and their dependent foals; non-breeding groups consist primarily of bachelors, but sometimes include young fillies (Penzhorn in press). Threats Cape Mountain Zebra were once extensively hunted for their skins, because they competed with livestock for grazing, and allegedly because they broke fences (Penzhorn 1988). Today, however, the greatest threat to the Cape subspecies may stem from the risk of crossing with Hartmann's Mountain Zebra, which are introduced to the Eastern and Western Cape. The most important threat to Hartmann's Mountain Zebras in Namibia is livestock production and farming activities such as fencing that prevent access to water. Increasingly sophisticated farming could further disrupt movements through fencing or by preventing access to surface water (Novellie et al. 2002). The risk of hybrization in Hartmann's Mountain Zebra is minimal, given that only a single subspecies occurs in Namibia and the fact that importation of Mountain Zebras of either subspecies has never been permitted (Novellie et al. 2002). In Namibia, there is commercial trade in Hartmann's Mountain Zebra skins. Populations need to be carefully monitored so that harvesting does not adversely affect population viability. Hartmann's Mountain Zebra are reportedly being harvested at a rate of about 2,000-3,000 per year, which may exceed their rate of population growth (e.g., Cape Mountain Zebra in Gamka Mountain Nature Reserve increase at about 5% per year; Watson et al. 2005). E. z. zebra is listed on Appendix I; E. z. hartmannae is listed on Appendix II. Various authors provide an historical perspective on the conservation actions taken for Mountain Zebra (Penzhorn 1988, in press; Novellie et al. 2002). Most surviving Cape Mountain Zebra are now found in national parks (793 animals in 2006) or provincial nature reserves (596 in 2006), although the numbers on private land have also increased (165; Novellie et al. 2002). Over 90% of the current total population of 1,389 Cape Mountain Zebras are derived from animals relocated from the Mountain Zebra National Park. The management of the Cape Mountain Zebra metapopulation requires the mixing of at least some animals from the three relict populations (MZNP, Gamkaberg, and Kamanassie), all of which are genetically depauperate, although this has been hampered by the relatively slow growth of the Kamanassie population. Chadwick and Watson (2007) have proposed facilitating the growth of this population by changing the fire management regime in the habitat preferred by zebra; acquiring adjacent land; and the translocation of Mountain Zebra onto adjacent land. Hartmann's Mountain Zebra occur in four key protected areas in Namibia: Skeleton Coast Park, Etosha National Park, Namib- Naukluft Park, and Ai-Ais-Hunsberg Park complex. Namib-Naukluft Park is particularly important with a population of around 2,300 animals (1998 estimate). Around 25% of the national population in Namibia occurs on conservancies in communal lands with the remainder on commercial livestock and game farms (Novellie et al. 2002). In South Africa, an estimated 280 animals occur on private properties and in the Goegap Provincial Nature Reserve. In the Northern Cape; the numbers of Hartmann's Mountain Zebra in South Africa's Eastern Cape and Western Cape comprise nearly one-quarter of the population of the subspecies in South Africa, and their removal and replacement with the Cape subspecies is a priority (Novellie et al. 2002, Penzhorn in press). Listed as Vulnerable as the total population is currently estimated at ca. 9,000 mature individuals, and could be subject to a decline exceeding 10% over the course of the coming 27 years, largely driven by annual harvesting of the Hartmann's Mountain Zebra population. At present, there is limited information available on the population trend of Hartmann's Mountain Zebras, but there is some evidence to suggest that they may well be declining. With the availability of further information on trends from parks and private lands, the species may need reassessment. Name(s) of the Assessor(s): Novellie, P.
Evaluator(s): Moehlman, P.D., Hrabar, H., Smith, R. and Hill, R.
Chadwick, P. & Watson, L.H., 2007, Management of Cape mountain zebra in the Kammanassie Nature Reserve, South Africa., South African Journal of Wildlife Research, 31-39. Crawford-Cabral, J and Verissimo, L.N., 2005, The Ungulate Fanun of Angola. Systematic List, Distribution Maps, Database Report. Lisboa:Instituto de Investifacao Cientifica Tropical. 277 pp. Groves, C.P. and Bell, C.H., 2004, New investigations on the taxonomy of the zebras genus Equus, subgenus Hippotigris., Mammalian Biology, 182-196. Joubert, E., 1973, Habitat preference, distribution and status of the Hartmann zebra Equus zebra hartmannae in South West Africa., Madoqua, 5-15. Lloyd, P.H., 2002, Cape mountain zebra conservation success: an historical perspective., Proceedings of a Symposium on Relocation of Large African Mammals., B.L. Penzhorn, 39-41, Wildlife Group of the South African Veterinary Assocation, Onderstepoort, South Africa. Moodley, Y. and Harley, E.H., 2005, Population structuring in mountain zebras (Equus zebra): the molecular consequences of divergent demographic histories. Conservation Genetics 6: 953-968. Novellie, P.A., Millar, P.S. and Lloyd, P.H., 1996, The use of VORTEX simulations models in a long-term programme of re- introduction of an endangered large mammal, the Cape mountain zebra (Equus zebra zebra)., Acta Oecologica, 657-671, , Penzhorn, B. L., 1988, Equus zebra., Mammalian Species, 1-7. Watson, L. H. , Odendaal, H. E., Barry, T. J. and Pietersen, J., 2005, Population viability of Cape mountain zebra in Gamka Mountain Nature Reserve, South Africa: the influence of habitat and fire., Biological Conservation, 173-180.